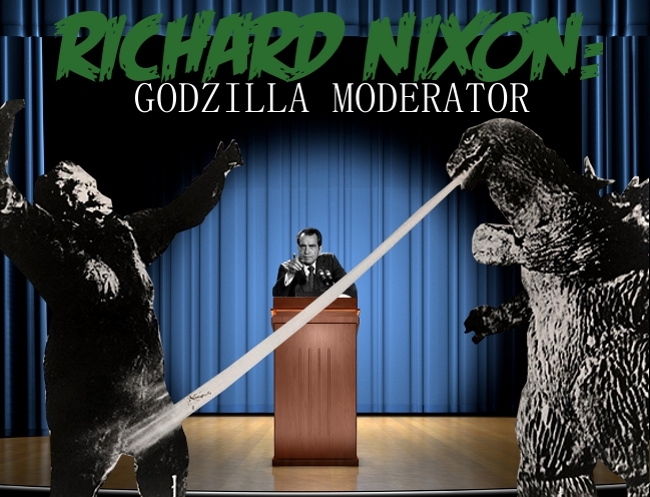 Click on the banner above to go to the Richard Nixon homepage at the University of Virginia's Miller Center. 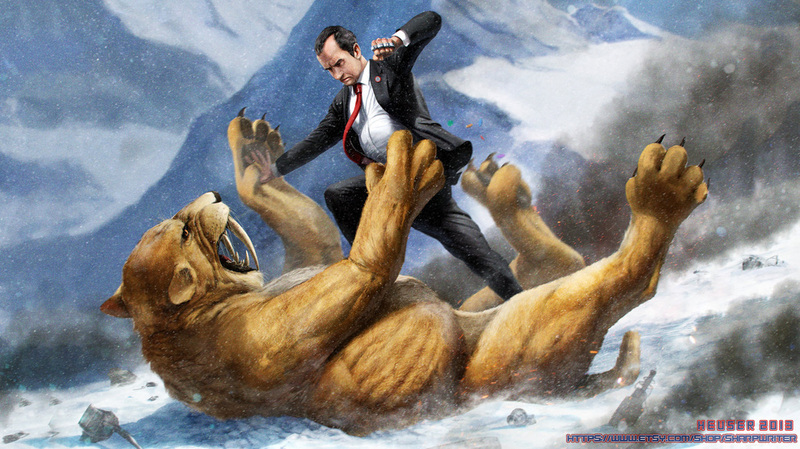 Click on the buttons below for in-depth information about Nixon's Presidency. The White House Bowling Alley is a one-lane bowling alley in the basement of the White House under the North Portico. Bowling lanes were first built in the ground floor of the West Wing as a birthday gift for President Harry Truman on April 25, 1947 (in the location of the present-day Situation Room). Ironically, Truman didn't care for bowling himself, but allowed his staff to start a league. These particular lanes were moved to the Old Executive Office Building in 1955 to make way for a mimeograph room. 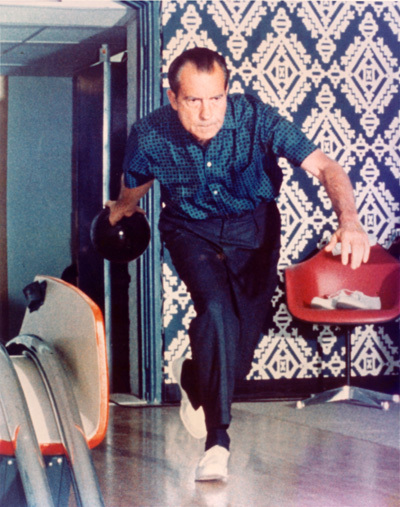 In 1969, President and Mrs. Nixon, both avid bowlers, had a new one-lane alley built (paid for by friends) in an underground workspace area below the driveway leading to the North Portico. 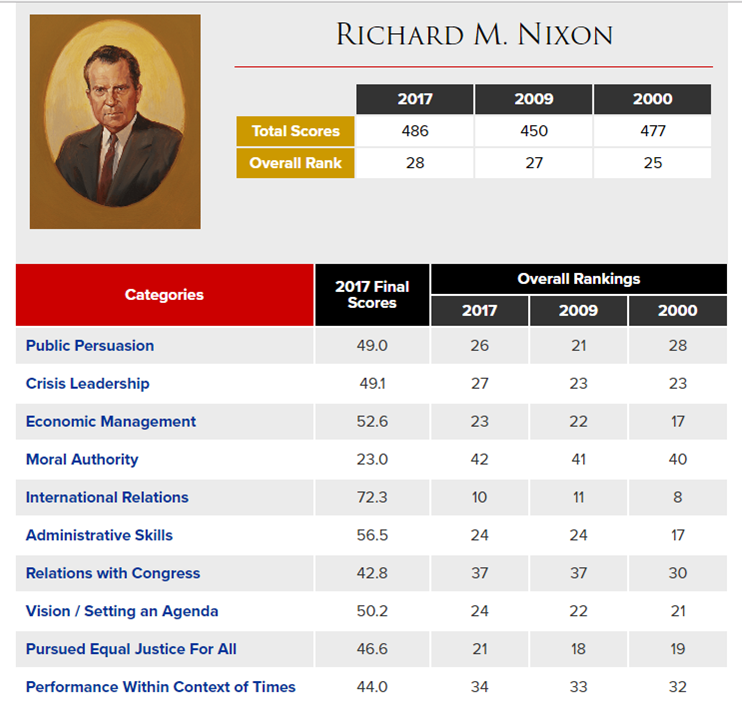 Nixon's high score was a 232 (or so he wants us to believe). On September 26, 1960, Nixon and JFK participated in the first televised Presidential debate. Nixon looked nervous, pale, and sweaty. Meanwhile, JFK was tan and came across as calm. 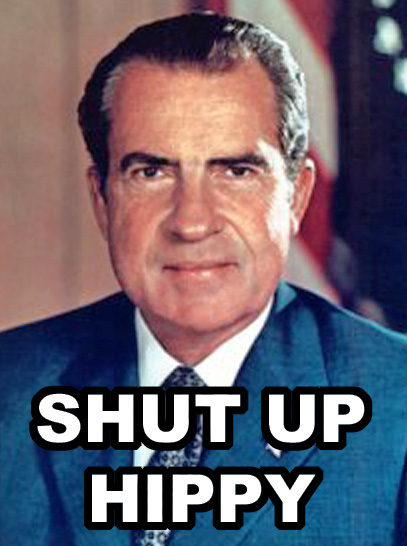 People watching the debate on TV thought JFK won... but those listening to the debate on radio felt Nixon won. 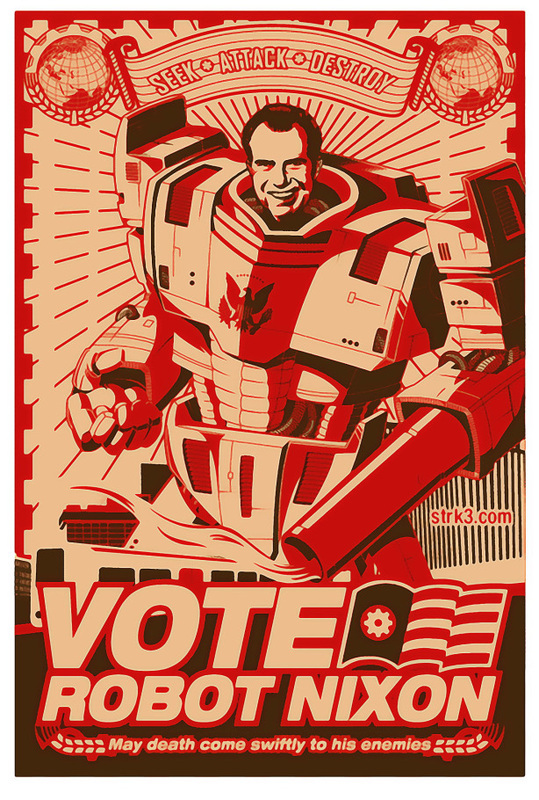 Historians believe this was the turning point in the campaign because it made JFK appealing to younger voters. 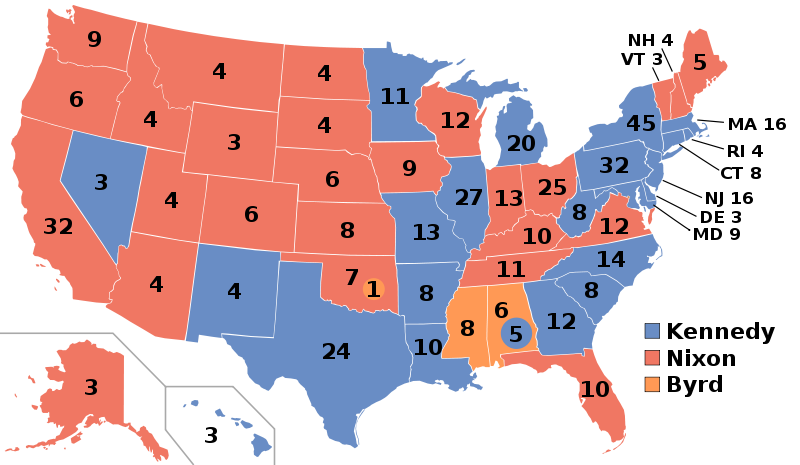 In the first election to have all 50 U.S. states participate, Nixon lost the Election of 1960 to John F. Kennedy by razor-thin margins. 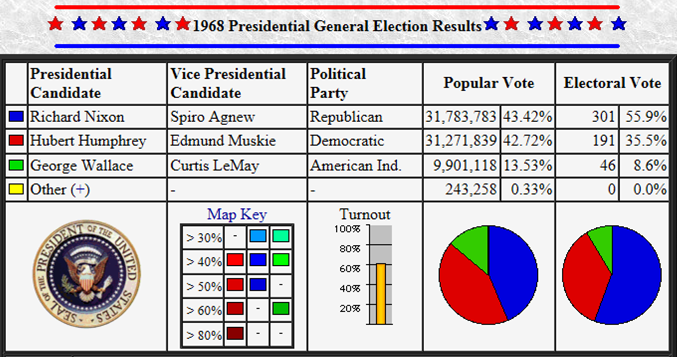 JFK won by 112,827 Popular Votes (49.7% to 49.6%) and 303-219 in the Electoral Vote. 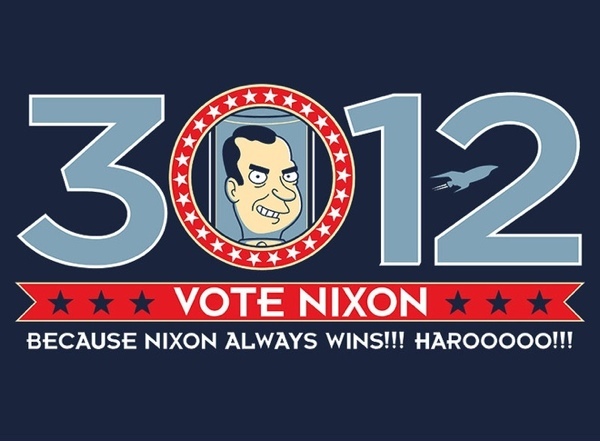 This was the closest election since Woodrow Wilson's victory in 1916. The narrow margins of the Election of 1960 would be surpassed by the election of George W. Bush in 2000. In February 1972, Nixon visited China, becoming the first President to visit a county not recognized by the U.S. (because of that whole "Communist thing"). Paranoid that he would lose his re-election bid in 1972 (especially after the Kent State Massacre in 1970 in which four students were killed during a rally against the Vietnam War... a war he had promised the nation he would get the U.S. out of), Nixon approved the illegal gathering of information on Larry O'Brien, the chairman of the Democratic National Committee, at the Watergate apartment and office complex in Washington, D.C. 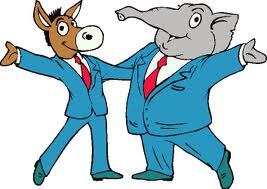 This was done so Nixon's re-election organization could monitor telephone conversations and photograph documents about Democratic donors and financial records important to the Democratic Party. (Nixon was Republican.) On June 17, 1972, this plan went up in smoke when five men were arrested for breaking into Watergate. Initially, the break-in was "back page news". 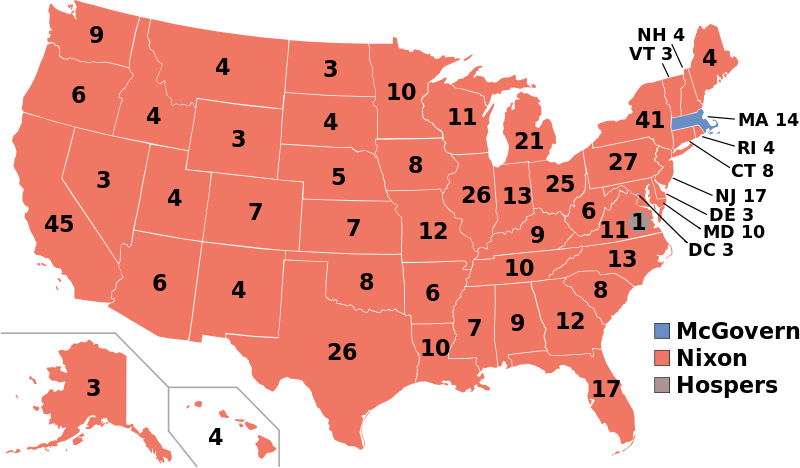 Nixon's paranoia was unfounded, and he went on to win the Election of 1972 by the largest margin (520-17 Electoral Vote) since James Monroe won 231-1 in 1820. Problems soon started, however, when the FBI traced cash found on the Watergate robbers to a slush fund used by the Committee for the Re-Election of the President. Ruh-roh! Nixon's attempt to cover up the incident turned it into the Watergate Scandal that forced him to resign on August 9, 1974 before a formal impeachment trial could begin. 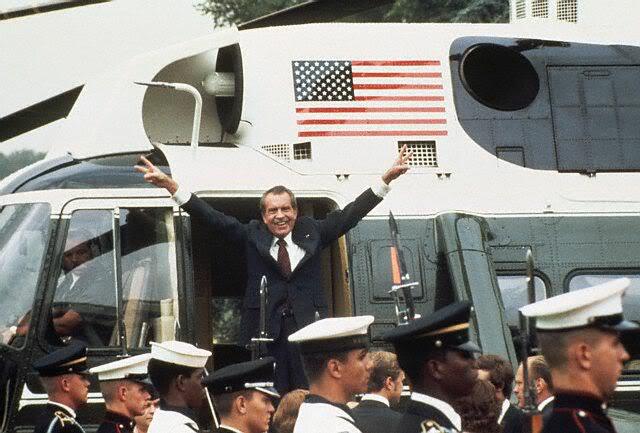 Nixon remains the only President to resign from office. 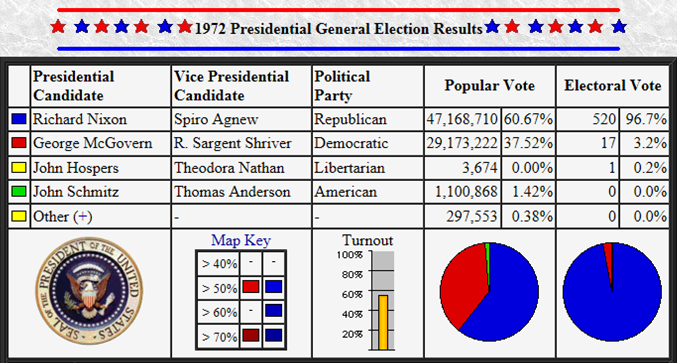 Ironically, Nixon's original Vice President, Spiro Agnew, resigned on October 10, 1973 amid charges of tax evasion. 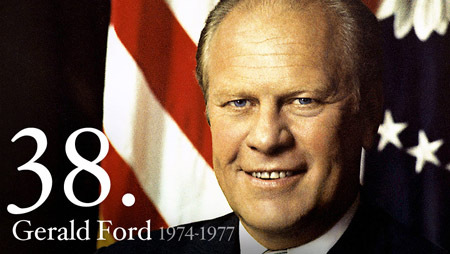 His resignation triggered the first use of the 25th Amendment as the vacancy prompted the appointment and confirmation of Gerald R. Ford, the House Minority Leader, as his successor. Just 10 months later, Ford would become President after Nixon resigned. On September 8, 1974, President Ford pardoned Nixon of all crimes associated with the Watergate Scandal. 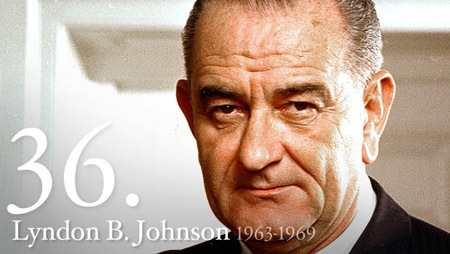 He granted, "a full, free, and absolute pardon unto Richard Nixon for all offenses against the United States which he, Richard Nixon, has committed or may have committed or taken part in during the period from January 20, 1969 through August 9, 1974." Nixon was reluctant to accept the pardon because it implied guilt but his friends and advisers warned him that any legal battle would be protracted and expensive and it would be very hard to find an impartial jury or receive a fair trial. Ford's pardon of Nixon angered many in the public who felt that Nixon should have been held accountable for any crimes he might have committed. Historians point to the pardon as a significant factor in Ford's failure to win re-election in 1976 against Jimmy Carter. Nixon held a plethora of jobs when he was younger, ranging from bagging groceries to pumping gas... to working a game booth at the Slippery Gulch Rodeo. Nixon met his future wife, Patricia, at a rehearsal for a community play in which they were both acting. He pursued her for more than two years... and even drove her to Los Angeles on weekends when she had dates with other men... then waited around to take her home again. In the late 1970s, Nixon bought a house in New York that happened to be next door to the home of historian and JFK friend Arthur Schlesinger, Jr. Not only were the two next-door neighbors, but they even shared a garden wall. Arthur's son, Robert, used to go Trick-or-Treating at the Nixon home as a child... wearing a Nixon mask, of course.